Dark Horse wants to get retailers to help them promote their digital comic store, so they’ve announced a Digital Retailer Exclusive program. Comic stores that sign up (before June 22) will get (via email) a sheet of 100 one-time-use codes. The retailer prints them out, hands them out to customers (how to determine which is an open question), and with the code, a reader can download a free eight-page digital story. 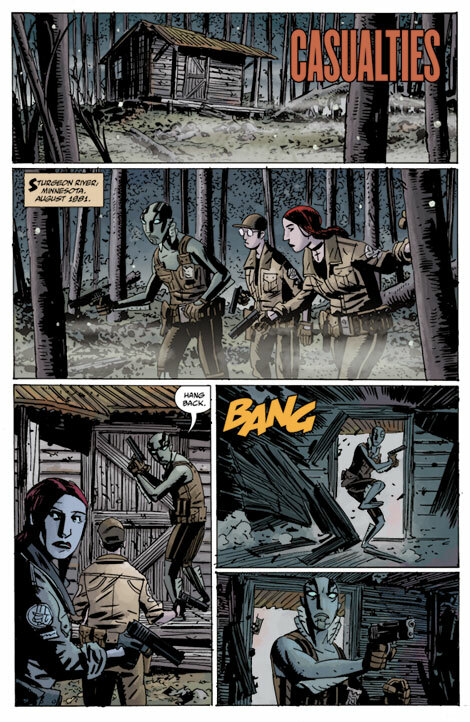 In July, the comic is BPRD (page shown here); in August, Buffy the Vampire Slayer; and in September, Mass Effect. They’re promoted as being Dark Horse’s “hottest titles” and containing “never-before-seen material”. Not only do we want to bring people into the stores, but also show that the digital reader isn’t always the die-hard comic fan, it’s a new breed of reader — a more tech-friendly reader — who will be pleased to know the wonders of the local comic shop once he/she sets foot in one! So it’s an attempt to replicate Free Comic Book Day for just one publisher? Dark Horse, meanwhile, gets a targeted mailing list of forward-looking shops who are amenable to online cross-promotion. And fans get free short comics that will get them to try Dark Horse’s online store and potentially buy more issues in the lengthy series featured. It’s a shame that the program isn’t weekly, which would really drive traffic to brick-and-mortar stores.